Almonds: A Source of Healthy Molecules or a Risk of Aflatoxins Human Exposure? Background: Almonds are edible seeds of almond tree (Prunus dulcis) currently cultivated around the world in dry and temperate climates. Throughout history, they have been a source of energy, essential fatty acids, protein and micronutrients like vitamins and minerals. Almonds are rich in monounsaturated fats and fiber that contribute to the hypocholesterolemic benefit from their consumption. On the other hand, almonds, like other nuts, are susceptible to aflatoxins contamination, well known toxic fungal metabolites. Methods: This paper briefly reviews health benefits of almonds composition and their contamination of aflatoxins, focusing on the evaluation of risks and benefits of these promising nuts. Results: Due to their unique nutrient composition, almonds could give consumers benefit against other cardiovascular and diabetes risks, such as excessive body weight, glucose homeostasis and oxidative stress. 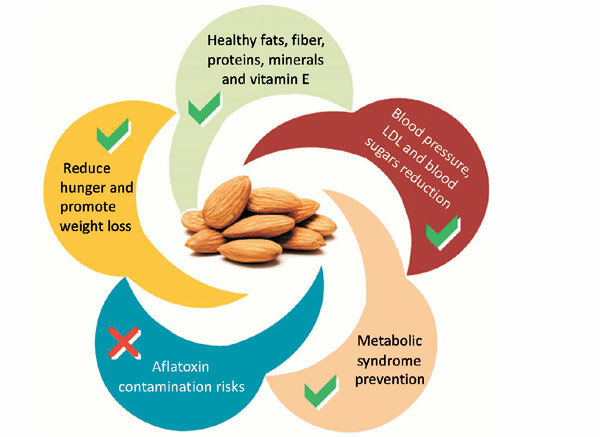 Many efforts have been made to ensure food safety and prevent diseases linked to aflatoxins exposure in almonds, as well as other tree nuts. Among these, research results show a consistent reduction of aflatoxins (above 50%) during roasting and sorting. Conclusion: So many aflatoxin reduction strategies have been set up for almonds over the years and many others are in progress. Thanks to these strategies and the strict monitoring of the almonds processing chain, we can already get benefit from their nutritional profile and added value to diet, while focusing as scientists on the constant improvement of the toxicity level assessment in the next years, so to prevent and contrast the metabolic syndrome, a widespread and chronic disease and escalating public-health issue. Keywords: Aflatoxins, almonds, cardiovascular, diabetes, exposure, health, risk. Title:Almonds: A Source of Healthy Molecules or a Risk of Aflatoxins Human Exposure? Keywords:Aflatoxins, almonds, cardiovascular, diabetes, exposure, health, risk. Abstract:Background: Almonds are edible seeds of almond tree (Prunus dulcis) currently cultivated around the world in dry and temperate climates. Throughout history, they have been a source of energy, essential fatty acids, protein and micronutrients like vitamins and minerals. Almonds are rich in monounsaturated fats and fiber that contribute to the hypocholesterolemic benefit from their consumption. On the other hand, almonds, like other nuts, are susceptible to aflatoxins contamination, well known toxic fungal metabolites.